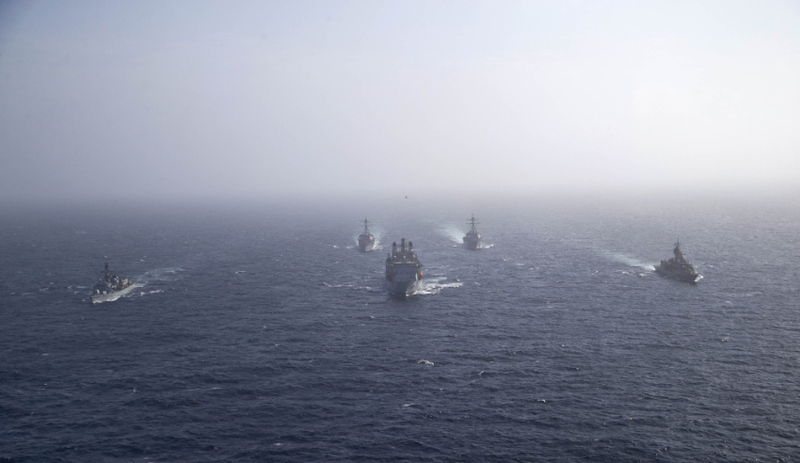 HMAS Perth (right), RFA Fort Victoria, HMS Portland (left) and USS Nitze and USS Mason in the Middle East Region during Ship Anti-submarine warfare Readiness/Effectiveness Measurement Exercise SHAREM. Image via Commonwealth of Australia, Department of Defence. One of Australia’s top universities has secured funding for major research on how new technologies for detecting submarines will impact nuclear weapons strategies in Asia. From a field of 55 bids, the Australian National University's National Security College (NSC) took out one of eight Carnegie Corporation of New York grants of more than half a million dollars (US$450,000). The grant will cover a two-year research project that involves partners in Australia, India, the UK and the US, and consultations with experts in China, France, Norway and Japan. Head of the NSC Professor Rory Medcalf, a principal investor in the project, said it will build on his previous research on the risks of arms racing and crisis escalation involving the Chinese and Indian nuclear-armed submarine programs. "This project will ask vital questions about whether new technologies for finding submarines could change nuclear strategy, especially in Asia," Professor Medcalf said. "Basically, we want to know whether disruptive changes in maritime technology will increase or lower the risks of nuclear war. This will inform our recommendations for policymakers around how best to address those risks." The international team will look at how the new dynamics of nuclear deterrence and anti-submarine warfare will play out, notably as China, India, Pakistan and North Korea all pursue sea-launched nuclear weapon ambitions. Former naval officers, arms control diplomats and scientists will combine their knowledge with the academics across the ANU College of Asia and the Pacific (CAP) to take part in the multi-disciplinary project. The Carnegie Corporation of New York was established by American industrialist and philanthropist Andrew Carnegie, once the wealthiest man in the world, in 1911 to promote the advancement and diffusion of knowledge and understanding.